Radiator caps can go bad and need replacing which is an easy task most anyone can do. 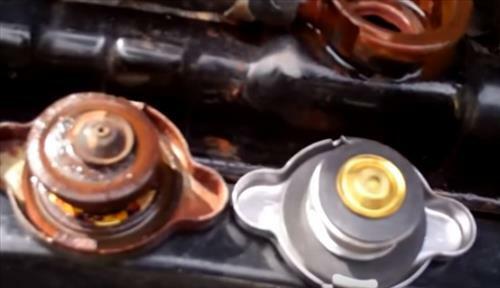 Remember never to remove a radiator cap while the engine is hot as the cap likely is under pressure and boiling water can spray out. 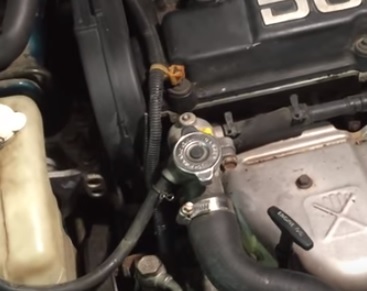 Only remove the cap when the engine is cold. What is the Function of a Radiator Cap? The basic purpose of the cap is to give a pressure outlet when an engine becomes hot and overheats. It does this with a spring loaded plunger that has a set pressure point to give way. When the pressure is released water will spill out into the reserve or from the cap itself. As a cap ages the spring that controls the pressure can release early letting fluid spill out. This can leave a vehicle low on fluid and lead to overheating which in turn make the cap leak out more. Air also is let into the system which passes air bubbles into the cooling system. 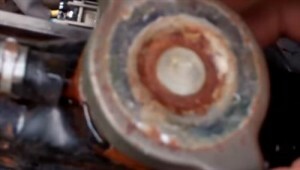 Since air is not good at transferring heat quickly a motor can overheat more easily when air bubbles are in the system. Symptoms can include overheating, burnt stains around the cap, and loss of fluid. Here white spots around cap show where fluid has been leaking out. 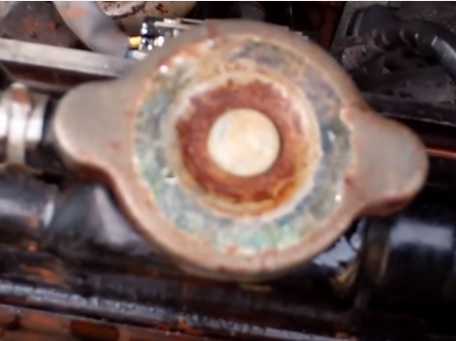 This radiator cap is rusted and needs replaced. 1… The first step is to buy a new radiator cap from an auto part store or online. 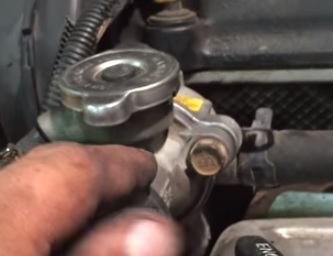 2… Be sure the engine has cooled down and the cap is no longer under pressure. 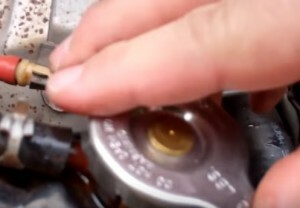 3… Remove the cap by pressing it down and turning it counter-clockwise. 4… Match the old cap to the new cap making sure they are the same. 5… Put the new cap on by matching the notches, pressing down and turning it clock-wise.